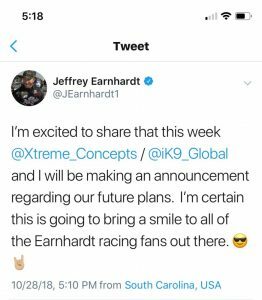 South Carolina – NASCAR driver Jeffrey Earnhardt posted a tweet to fans that the 4th Generation Earnhardt racer would be sharing exciting news this coming week. Earnhardt has been working closely with his sponsor Xtreme Concepts/IK9 to take the next step for the future of Earnhardt racing. The news is sure to bring smiles to Earnhardt Nation. © 2019 JeffreyEarnhardt.com. All rights reserved.